On Saturday 31st March, the Christopher Alder Campaign for Justice and supporters held a memorial march to mark the 20th anniversary of Christopher’s death. 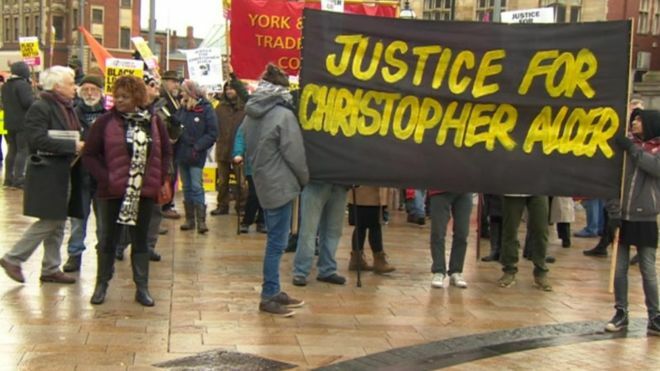 On 1st April 1998, Christopher died, handcuffed, lying face down on the floor of a Hull police station. As Christopher choked to death, police officers could be heard on CCTV laughing and making monkey noises. The disgusting police treatment of Christopher – and the subsequent treatment and harassment of his family – makes clear the racist impunity with which the police operate. Saturday’s march brought around 200 people out on the streets of Hill to commemorate Christopher’s life, and to continue the fight for justice. Rousing and sobering speeches were following by a silent march around Hull and a deeply moving poetry reading. Following the march, a public meeting was held in a community space. The venue was filled with people who queued up to and out of the door. The panellists and the audience all praised Christopher’s sister, Janet, for her tireless campaigning for justice. Discussions drew links between Christopher, David Oluwale, Stephen Lawrence, Joy Gardner, Rashan Charles, Darren Cumberbatch and countless others. The continuation of deaths (and particularly Black deaths) at the hands of the police, requires our ongoing attention. The police cannot continue to so easily disregard Black lives. The Northern Police Monitoring Project stands in solidarity with Janet Alder, with the Christopher Alder Campaign for Justice, and with all who struggle against police abuses of power.